As for the previous years, Re.S.Artes has helped the Experts during the vetting of BRAFA 2019. Our skills, knowledges and know-how is, for this kind of in situ operations, a major asset for this worldwide kown art fair. Re.S.Artes was at the MoDIM 2018 international meeting which was at Pessac in october 2018. Focused on the mortar's dating, this meeting was usefull to take stock of knowledge in this research field. Dr. Emmanuel Vartanian is Expert at the Bordeaux Court of Appeal Expert, a new evidence of the skills and know-how of Re.S.Artes. Drs Céline Roque and Emmanuel Vartanian are CAMARI. It allows Re.S.Artes to make numerical X-Ray radiography in situ , for objetcs of art or archaelogical artifacts. Armed with our experience on the analysis of terracotta objects, Re.S.Artes has made, during the Cultures Fair, a conference titled : "The View of Science on the terracotta objects of Africa, Asia and South America: antiquity test and imaging". Re.S.Artes has presented, during BRAFA 2016, a lecture about the contributions of the Carbon 14 dating technique for objects of art, "des objets faux aux faux à priori" (the video is available on the following link, or from our library). Re.S.Artes is membre of GMPCA, international network of laboratories involved into scientific methods applied on ancient material studies. Re.S.Artes is also member of two important french network of specialists in analysis of ancient objects: REFRAIN (REseau Francophone du Radiocarbone : Analyses et InterprétatioN) for radiocarbon (C14), and CAI-RN (Compétences Archéométriques Interdisciplinaires - Réseau National) for all kind of approaches on archaeological objects. Re.S.Artes develops the scientific analysis of rock cristals, by participating in the creation of a more spacious analytical chamber, in order to study bigger objects. Discover how the measurement of the hydration of the object's surface using ERDA allows to establish the antiquity of the work of this material. Re.S.Artes has acquierred the RTI technology (Reflectance Transformation Imaging) which allows to obtain optimal views of a painting's surface, or of a sculpture's surface, madifying at will the grazing light angle. Re.S.Artes innovates for the scientific expertise of wood sculptures. We develop a new methodological approach which, completing the datation of the material, allows to establish the antiquity of the carving. An article describing the first results of these researches was submitted to an international scientific journal. Vartanian E., Barres O, Roque C., "FTIR spectroscopy of woods: a new approach to study the weathering of the carving face of a sculpture” Spectrochimica Acta Part A – Molecular and biomolecular spectroscopy, 1255-1259. Re.S.Artes is the preferred partner of numerous Archaeological department services for chronological studies using carbon 14 dating on any type of organic materials, and for luminescence dating (thermoluminescence, OSL). Re.S.Artes publishes its chronological studies in Archaeology, in parternship with the Archaeologists in charge of the researches. Our two last publications are now available. 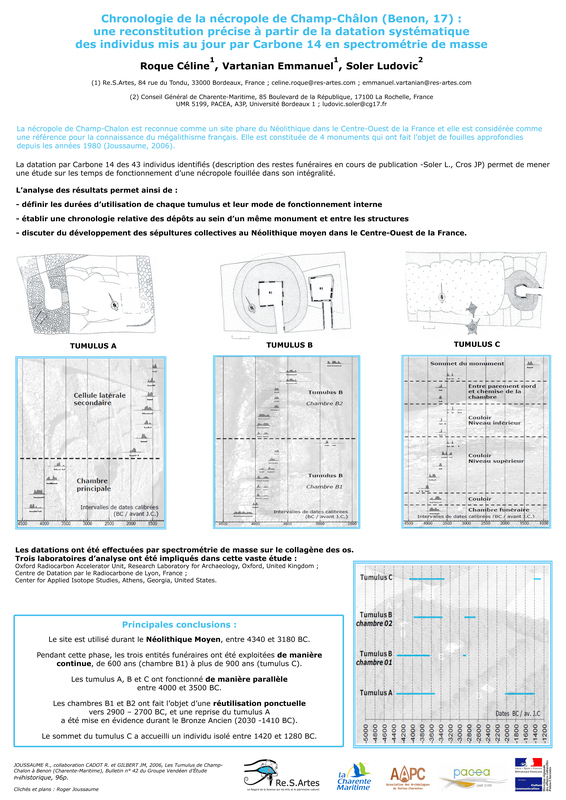 Vartanian E., Soler L, Roque C., Dupont C., Save S., 2013, "Chronologie par C14 et accès aux ressources alimentaires en milieu littoral : détermination des effets réservoir - Le cas des coquillages du site des Quatre Chevaliers à Périgny (Charente-Maritime)", Ancient maritime communities and the relationship between people and environment along the European Atlantic coasts / Anciens peuplements littoraux et relations homme / milieu sur les côtes de l’Europe atlantique, BAR International Series 2570, Edited by M-Y Daire, C. Dupont, A. Baudry, C. Billard, J-M Large, L. Lespez, E. Normand and C. Scarre, p. 553-559. 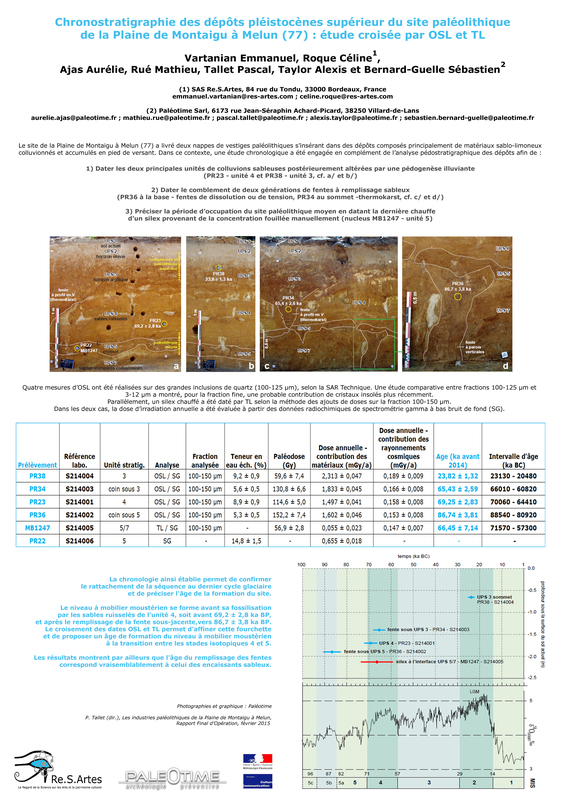 Soler L., Save S., Dupont C., Roque C., 2013, "Le Fief des 4 Chevaliers, études paléo-environnementales aux abords d’une enceinte néolithique sur le littoral atlantique à Périgny (Charente-Maritime, France)", Ancient maritime communities and the relationship between people and environment along the European Atlantic coasts / Anciens peuplements littoraux et relations homme / milieu sur les côtes de l’Europe atlantique, BAR International Series 2570, Edited by M-Y Daire, C. Dupont, A. Baudry, C. Billard, J-M Large, L. Lespez, E. Normand and C. Scarre, p. 635-646. Re.S.Artes takes part of the formation of futur intendants of art collections, in partnership with the University of Bordeaux 3, in the Master « Régie des œuvres d’Art et Médiation culturelle » (Intendance of Artwork and Cutural Mediation). Follow Re.S.Artes on Twitter, Facebook or LinkedIn. Follow Artes' Adventures in « la Science pour l’Art Illustrée » on our Facebook and in our Library.